Beginning in January, Crushstation competed in New Hampshire, Michigan, Ontario, and New York, earning a spectacular 7 of 7 wheelie contest wins and stellar debuts on the Monster Jam stadium circuit, finishing 5th of 16 trucks in Detroit and 5th of 12 trucks in Toronto. 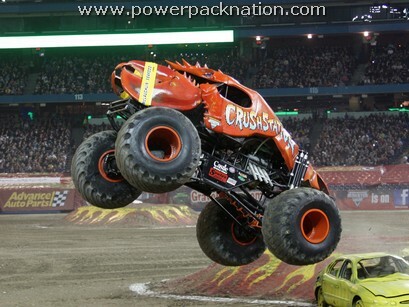 In addition, the Toronto Monster Jam was filmed for SPEED TV’s “Monster Jam” and Crushstation will make its T.V. debut on March 24, 2012 at 5p.m.eastern on SPEED TV. February and March boasted more success for the Bottom Feeder Motor Sports team as they rocked New England. Crushstation racked up more wheelie contest wins and crushed the competition in racing and freestyle. To end the year, Greg and Crushstation competed in Bridgeport, CT. against the best competition in the world including Grave Digger, ultimately winning 4 out of 4 wheelie contests, 2 of 4 racing competitions, and 2 of 4 freestyle wins!